The force with which the digital transformation is starting to steamroll automated production will be obvious at automatica 2018, in Munich from June 19 to 22. Terms like cloud robotics, deep learning and smart production are no longer just catchwords, but instead are increasingly becoming experienced reality. The rapid development steps of digital networking into factories is even surprising industry insiders. The reason for it: although “becoming smart” costs money, the investments are worth it. This has also been shown in a recent study entitled “The Digitalization Productivity Bonus: Sector Insights” by Siemens Financial Services (SFS). According to it, manufacturers can achieve an annual increase in productivity through reduction of manufacturing costs by up to 9.8 percent thanks to automation and digitalization of their production systems. The enormous productivity gains help companies to free liquidity, with which they can finance investments in new technologies. Numerous practical examples prove already how efficient and highly productive smart production can be. 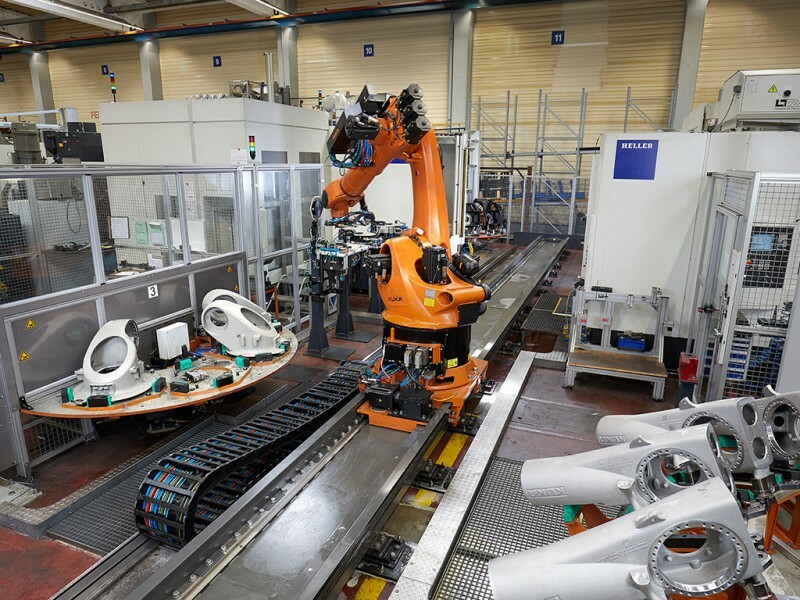 Example of Kuka: Kuka connects the analog and digital worlds in the manufacture of robot components in a fully automated, networked cell. The cell shows how a robot produces robot components in collaboration with two machining centers. A six-axis robot takes over handling of the cast components. With its work area extended over a linear unit, it can operate both machining centers and additionally perform deburring work. Insofar, this is the analog world. The digital world is connected through networking of all components with each other and with the Kuka cloud. In this context, all active components of the cell are integrated in the smart production environment. All data of the machines, robots, machining spindle, and the tools are collected in the Kuka Connectivity box, forwarded to the cloud, processed and visualized in configurable overviews called dashboards. As a result, operators, maintenance and management have full transparency about the production process at any place and at any time. 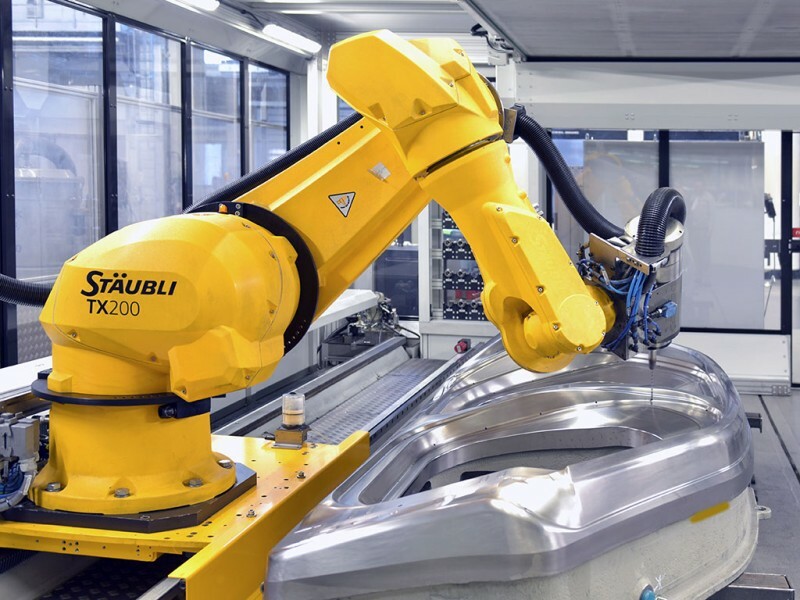 The Audi Competence Center for Plant Equipment and Forming Technology demonstrates the benefits of digital networking in the machining of forming tools. What people do not like here: processes opposed to digital networking. Consequently a robot machining center has now replaced four radial drilling works. As of recently, a high-precision industrial robot TX200 from Stäubli has made the deep-drilled holes. The great advantage of the now consistently digital process chain: The positions for the holes, which used to be determined in a time-consuming process in the factory hall, can already be specified today in tool design in a CAD system and transferred into the offline programming system of the robotic cell. With this digital process, such time-consuming work is eliminated completely. The result: a reduction of throughput times of approx. 60 percent. The exhibitors at automatica will prove that the future of industrial manufacturing will be completely networked as well as show which benefits result from it and how easy it is to implement the open networks required for it. It is already clear today: Many companies have the exhibition motto of “Industry 4.0”, “Smart Factory” or “Digital Networking”, and the innovations that will be presented in Munich have more a revolutionary character than an evolutionary one. Example of Fanuc: The Japanese robot giant provides an intelligent platform for the exchange of data in real time with the FIELD system (Fanuc Intelligent Edge Link and Drive). 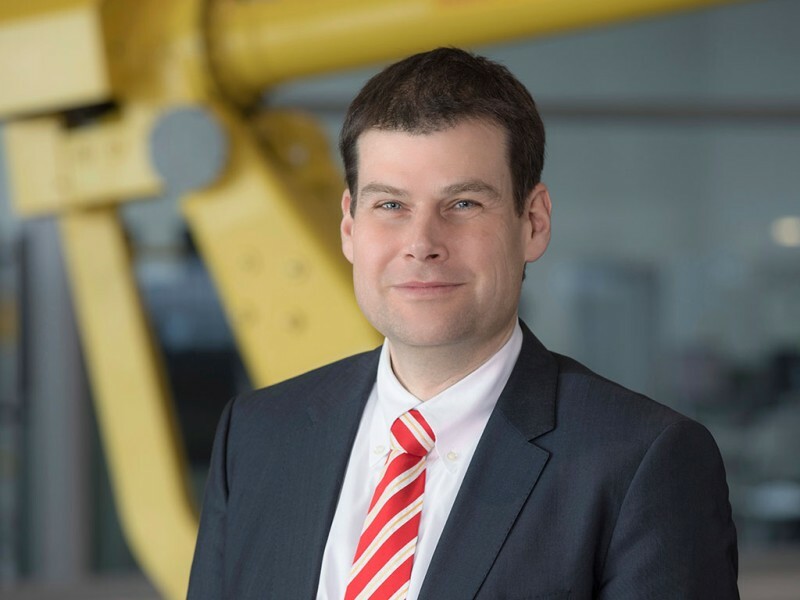 Fanuc Managing Director Matthias Fritz stated: “We believe that FIELD is a milestone in industrial networking.” Among the tried-and-tested modules of this platform, there is the operation management software “Linki” that captures, sorts, hosts and analyzes machine data within the system. As a result, the “vital signs” of a machine can be monitored and conclusions drawn for preventive maintenance. This sub-task is performed by “Zero Down Time” (ZDT), a module that is already being used successfully in the automotive industry. In the USA, General Motors has organized preventive maintenance for more than 10,000 robots with ZDT. However, FIELD can do even more: It also includes Industry 4.0 functionalities such as “Deep Learning”, in which robots communicate their “experiences” with each other. Robot and component manufacturers are currently working intensively on pioneering solutions to get the right data at the right place at the right time and consequently provide the basis for intelligent networking. The dynamism, with which digital transformation is changing industrial automation, makes the upcoming automatica the place to be for all providers and users of automation and IT. With its own topic area IT2Industry in Hall B4, automatica also provides a platform for IT vendors.